No Wasted Time: Let us do the work for you. We can quickly find reputable yard cleanup companies in your area. No Uninformed Decisions: You will receive access to yard cleanup company reviews. Most people will spend between $175 and $500 to hire a fall yard cleanup service for a half acre yard with an average amount of trees. The national average reported cost is $335. The minimum cost a homeowner paid was $75 while the maximum reported cost was $900. The most popular answer to this question is to start on or around autumnal equinox which is on or around September 22nd. Another popular answer is to start cleaning up when 30% of the leaves have fallen from the trees. The one thing you do not want to do is wait until all of the leaves have fallen. Do the task gradually over several days and you will save yourself from feeling overwhelmed or doing a major cleanup in the cold. Procrastination is not your friend when it comes to leaf cleanup. A professional lawn or landscaping service can handle your spring and fall yard cleanup for you. If you dread the thought of spending your weekend raking, seeding, weeding or mowing, you might want to consider hiring a professional. Standard yard cleanup services vary from one company to the next, but they generally include cleaning out landscaped beds, removing weeds, clearing all debris and clutter from the yard, pruning shrubs and removing dead foliage or tree branches. In some cases, the service includes installing new mulch. The cost of a professional yard cleanup depends on the size of your property, the number of trees, and whether the leaves and debris can be left curbside or must be hauled away. For a half-acre lawn with a fair amount of trees, budget anywhere from $200 to $500. Saves time - Hiring a professional yard cleaning service saves you a lot of time and effort. You can spend the time you would have been working in the yard doing something a little more fun. Professional look - Yard cleaning services are experts at making lawns look beautiful. It’s hard to match the look with a DIY project. Hire a professional service and you just might have the best looking lawn in the neighborhood. More expensive - If you don’t want to invest the time and effort into yard cleanup, be willing to pay for it. Cleanup services can be expensive. Yard cleanup is an important part of routine lawn maintenance. Most homeowners tackle the project twice a year, once in the spring and once in the fall, to tidy up the lawn and prepare it for the coming change of season. DIY yard cleanup can be as simple as raking and bagging leaves and removing fallen branches, or it can be an involved process. In the spring, you’ll probably want to trim the trees and hedges, fertilize the lawn and apply a weed treatment. In the fall, you might want to winterize the flower beds and remove dead foliage. DIY yard cleanup is very inexpensive. Essentially, your cost is the time you invest. You’ll need just a few simple supplies, including a rake, pruner and leaf bags. However, if you’re looking to make the job easier, you can invest in a leaf blower. Decent models sell for just $100 to $200. 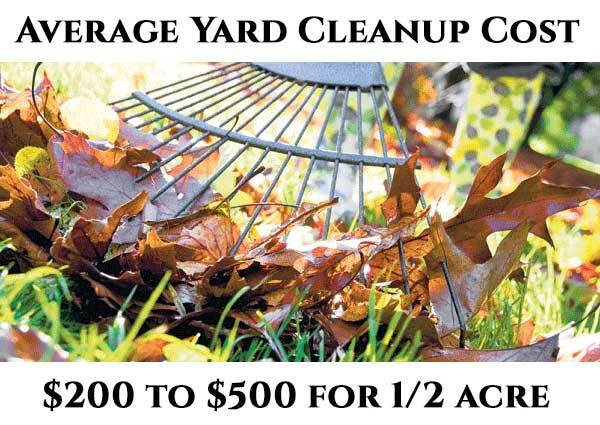 Saves money - You can save a significant amount of money - hundreds of dollars, in fact, by tacking yard cleanup yourself. Professional services can be expensive. More control - By handling your own yard cleanup, you can ensure that the job is done just the way you like it. If you’re very particular about the way your yard looks and you have the time to spend, DIY is the way to go. Hard work - A yard cleanup is a major project. It’s difficult work that can be tough on the body. Some people simply dread it. Time consuming - A complete yard cleanup will eat up most of a weekend. If your yard is in rough shape, it could take several weekends. You need to be willing to invest a significant amount of time into the project. Do You Need a Yard Clean Up Pro Near You?